The City's Energy Group reduces electricity and natural gas use and greenhouse gas emissions from City facilities through advancing energy conservation, efficiency and solar power generation. It also advocates for and supports planning and implementation of energy efficiency and renewable energy programs for Oakland residents and businesses. 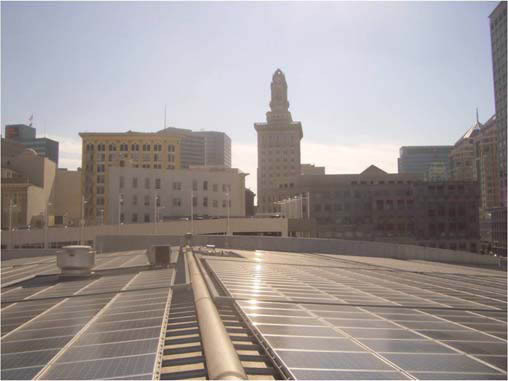 Facility Energy Retrofits - The City of Oakland has retrofitted 129 of its 141 largest facilities, creating savings of over $1 million per year to the City's budget. Civic Green Building Ordinance - The City adopted a Civic Green Building Ordinance requiring all new City facilities over $3 million in construction costs to meet LEED Silver green building standards. Solar Energy - The City has installed 1 Megawatt of solar electric panels on the rooftops of our Municipal Service Center and the downtown ice rink. These panels provide approximately 2.3% of our municipal electric load. American Recovery and Reinvestment Act (ARRA) Projects Generate Energy and Cost Savings! The City of Oakland, Public Works Agency received $3.9 million in ARRA stimulus funding for an Energy Efficiency Conservation Block Grant (EECBG) from the U.S. Department of Energy. This funding is being used for six projects in the City to improve energy efficiency and city operations, retain jobs, and lower operating costs and greenhouse gas emissions. The six projects are: lighting upgrades to City facilities including City Hall; heating and ventilation upgrades to old systems at the Police Administration building and Civic Center; bicycle lane improvements; conversion of Civic Center data center servers to virtual servers; green building training for City staff, and synchronization of traffic signals near the Coliseum and Hegenberger Road to improve traffic and transit flow during events and reduce fuel use. For more information about the City of Oakland ARRA projects please visit the City's Economic Recovery and Reinvestment page.